Could one of these startups win your ice cream loving heart? Ben & Jerry, meet Susie and Veronica, Grace, and Dan — Boston entrepreneurs hoping they’ve launched the next hit in high-end ice creams. 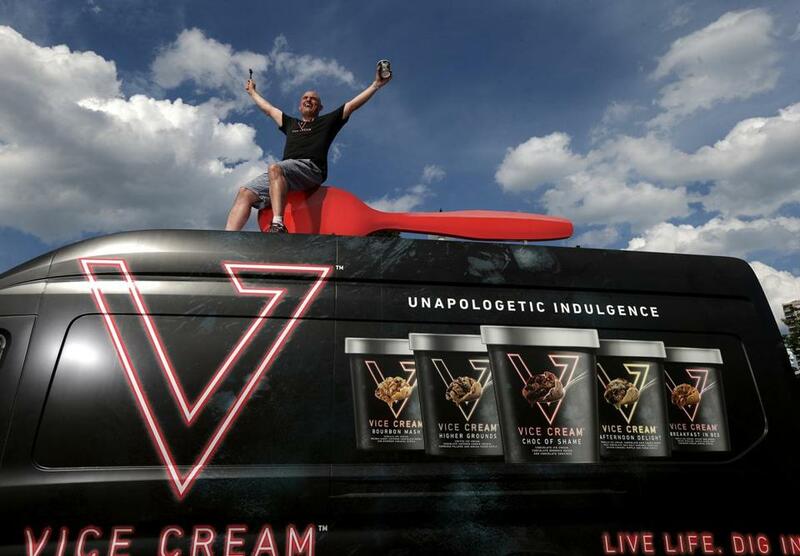 Dan Schorr atop the Vice Cream spoon truck, part of the zestful, zippy company persona he’s trying to create. At 17, Grace Connor hopes her lifelong love of creating new flavors means success for her little g ice cream. When Grace Connor turned 16 last March, the license she got wasn’t to drive, it was to manufacture frozen desserts. Connor is founder of little g ice cream co. , an artisanal ice cream maker in Boston. The teen already had plenty of practical experience. She started tinkering in her family’s kitchen when she was 8, mixing foods that were familiar to her — hot chocolate, cereal, banana bread, potato chips — into ice cream. As she got older, Connor, now 17 and a rising senior at Milton Academy, decided she wanted to start her own business, in part because she thought ice creams at stores and shops were either too plain or too strange. “It’s hard to find ice cream I don’t like, but finding one I love is totally different,” she says. Connor liked Ben & Jerry’s creative flavors, but she imagined even higher-quality local ingredients. For little g, she makes most of her ingredients from scratch — from the ice cream base (made with New England dairy products) to the toffee, brownies, and torched marshmallow swirls (to name a few) that she mixes in. Taking classic ideas and cranking up the volume is her forte: little g Triple Cookie Dough blends homemade chocolate chip, double chocolate chip, and sugar cookie doughs. She also likes to evoke nostalgia with tastes such as S’mores, Hot Chocolate, and Marshmallow Rice Crispy Treat, “flavors you’ve had before, but maybe not in ice cream,” Connor says. Getting all the licenses and permits she needed took about six months. During the school year, Connor finished her homework before baking, churning, and then hand-packing pints of ice cream, sold for $12 on little g’s website and at specialty store Siena Farms in the South End as well as Formaggio Kitchen in Cambridge (which charges $13.95). Her delivery team, also known as her dad, and sometimes her older sister, fulfills Web orders by appointment (Connor often rides along). The plucky young entrepreneur has plenty of competition. Stroll down the frozen dessert aisle at your grocery store and you’ll see more ice cream options than you could eat in a year — not including ice cream’s extended family of gelatos, sorbets, frozen yogurts, and dairy-free. The big national brands (Ben & Jerry’s, Haagen-Dazs, Edy’s, Breyers) are owned by massive conglomerates. But startups like little g, which Connor has funded from savings built up over years of selling baked goods, promise consumers a better-tasting product. And they’re gaining shelf space. Stores like Whole Foods are making room for them because consumers want small-batch flavors, says Roger Perrett, Whole Foods’ senior buyer for the North Atlantic grocery team. “Artisanal” doesn’t have a formal definition in the ice cream business, but made by hand from largely local ingredients is good shorthand, and it is a growing segment of the $12 billion US ice cream market. Whole Foods stores in New England carry local brands like Gelato Fiasco (all milk comes from Maine cows), Tea-rrific (tea-infused ice cream, from Bridgeport, Connecticut), and the Cambridge flavor festival that is Toscanini’s. Perrett says that the chain chooses local brands based on product quality and ingredient sourcing. The chain makes room for artisanals by cutting slower sellers among big brands. One of those artisanals is Boston’s Batch ice cream. Founders Susie Parish and Veronica Janssens, partners in life and in business, left careers in technology and civil engineering in 2010 to make ice cream that didn’t have corn syrup, “natural flavors” that may come from things in nature other than the ingredients, or xanthan gum or carrageenan, additives that improve the texture of ice cream. “We wanted to make a commercial ice cream that resembled what we made at home using only real ingredients, no additives,” Parish says. Batch uses only milk, cream, eggs, sugar, and the real flavor of the ingredient itself, locally sourced or from Fair Trade suppliers wherever possible. Parish believes Batch is the only company not using artificial extracts of any sort, which she says means it makes the purest carton of ice cream. Its Vanilla Bean ice cream is made from organic vanilla beans sourced directly from a farm, then steeped in homemade custard. One new flavor, Caramelized Banana and Walnuts, involves bathing whole bananas in brown sugar before roasting them. The flavor won a 2016 innovation award from the Specialty Food Association. Parish says a segment of consumers “are willing to pay a higher price for a better food.” Batch charges $5.99 to $7.99 a pint, depending on the store. Batch uses only milk, cream, eggs, sugar, and the real flavor of the ingredient itself. Federal standards say ice cream has to be at least 10 percent butterfat and weigh at least 4.5 pounds per gallon, which is achieved by forcing air into ice cream mix (the air softens it). “Premium” is defined by its maker, but generally has more butterfat and less air — and a higher price tag. The United States launches more handcrafted ice creams than any other country, according to market research firm Mintel. Small-batch ice creams that cost $8, $12, even $15 a pint are selling in cities around the country. 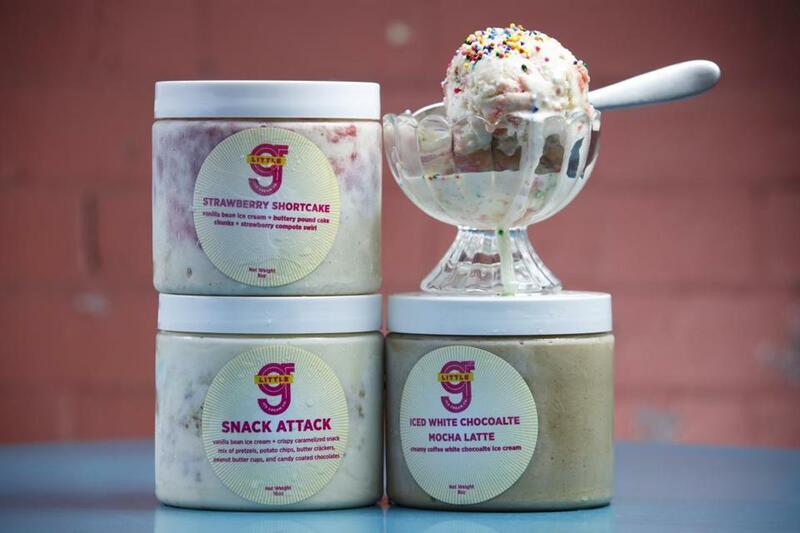 Interest in new flavors may help New England’s ice cream startups. Batch, which is sold at Shaw’s/Star Market, Stop & Shop, and others, in addition to Whole Foods, recently expanded to New York and soon will be in Southern California. And Connor, who is looking to raise capital, also hopes to distribute little g nationally. Expansion brings new challenges, of course. Here, local brands often don’t have to pay to get space on a freezer shelf. Nationally, though, larger retailers expect to receive payments, often in the form of free product. In New York City, even smaller stores want the first order free. Parish, who says that Batch is profitable, notes that they offer stores a bundle, including free product, weekly discounts, and in-store demos. Faigel says smaller producers are better at tapping into consumer desires because they can test ideas and recipes without derailing production, unlike the big nationals, which are set up to produce at scale. But even with market interest and incubator support, prepared-food businesses are difficult to get off the ground. There’s the upfront capital and complex permitting, labeling, packaging, and distribution challenges. Cash flow can be haphazard. Then there’s getting people to try something new. Dan Schorr, founder of Boston-based Vice Cream, which launched in May, knows all about capturing consumers’ attention. He helped start up PowerBar in the 1990s and went on to help create Pepsi’s emerging energy drink portfolio, including Starbucks Doubleshot, SoBe No Fear, and AMP. With Vice, he’s trying to entice consumers with an alternative to “healthier’’ options like gluten-free, lactose-free, and vegan ice creams. “It felt like no one was doing indulgence in what is an indulgent category,” Schorr says. Schorr didn’t always believe in indulging. But in April 2014, he was diagnosed with lymphoma and given three months to live if untreated. “I ate really well, I ran every day, and I got cancer,” he says. Now cancer-free and so bouncy he still seems to be marketing energy drinks, Schorr outsources production of Vice, a super-premium ice cream. At $5.99 a pint, his ice cream features cheeky flavors like Afternoon Delight, Choc of Shame, Breakfast in Bed, and Higher Grounds, coffee ice cream laced with soft espresso beans, a mocha fudge ripple, and chocolate-covered cookie crumbles. Like little g and Batch, Vice Cream’s goal is to become an iconic national brand. “That may sound crazy, but we think we can bring new consumers back to indulgent super-premium ice cream and give them permission to live life,” Schorr says. But even at high prices per pint, profit margins can be minuscule. The cost of ingredients, packaging, and distribution all come at a premium when you’re doing smaller runs. 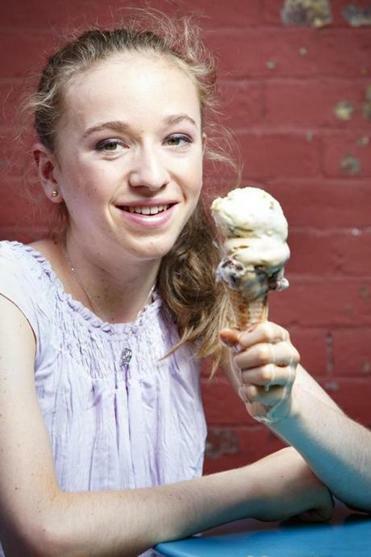 Grace Connor charges $12 a pint for little g ice cream and makes most of the mix-ins herself. Grace Connor knows this firsthand. Though she’s charging $12 a pint and making most of the mix-ins herself, “I can say that my ice cream is low-margin,” she says. At the Commonwealth Kitchen facility in Dorchester, she scoops out some Snack Attack (vanilla ice cream, pretzels, potato chips, buttery crackers, peanut butter cups, candy-coated chocolates) into a container. Two days ago, she was there concocting the base for this batch, which had to be pasteurized and chilled safely. Yesterday, she made all her mix-ins — caramelizing pretzels and potato chips, baking brownies and confetti birthday cake with buttercream frosting, and whipping up a mountain of cookie dough. Today she’s churning it, putting it in the machine for about eight minutes per batch. While it churns she chops up her baked goods, then folds them in. Everything is timed and weighed meticulously. Next, she packs the blend into her clear, pint-sized tubs labeled with her fuchsia-and-yellow little g logo.